On, November 1, more than 30 people joined our Aberdeen team to celebrate the opening of the new Aberdeen Integrated Operations Centre. 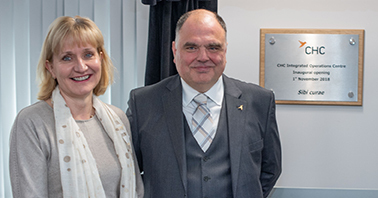 Deidre Michie, Chief Executive Oil and Gas UK, led the official opening, which marks the completion of the first phase of our $5m investment in the Aberdeen operation. Guests received a tour of our new facilities as well as an overview of phase two – the redevelopment of the new passenger terminal which is expected to open next spring. CHC also recently led the first of a new series of Aviation Awareness events which took place in Aberdeen. Working in partnership with Step Change in Safety, Bristow and Babcock, we welcomed around 25 senior oil and gas executives and safety representatives to the half-day session. Mark Abbey, Jon Hopkinson, Lee James and Mark Brosnan gave informative updates on RTBs, passenger logistics, engineering and triggered lightening – all topics which had been raised by the Offshore Helicopter Safety Action Group, co-chaired by Mark Abbey, EMEA Regional Director and the Mark Swann, Group Director Airspace Policy UK CAA, as areas of interest for the offshore workforce.